Process: Conversion of your video tapes to both Disc (DVD or Blu-ray) and Data File. 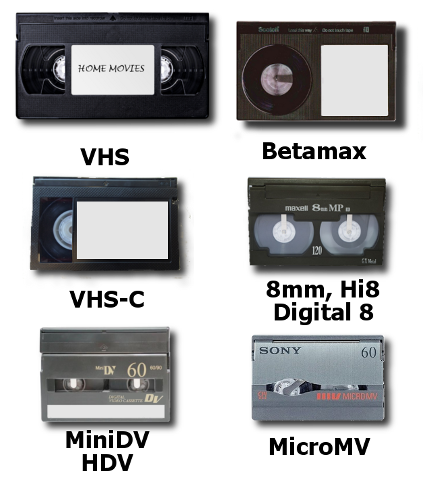 Supported Tapes: VHS, VHS-C, BetaMax, MiniDV, HDV, MicroMV, 8mm, Hi8, and Digital 8 tapes. We can transfer PAL and SECAM tapes for VHS tapes, 8mm tapes, MiniDV and HDV tapes, too. Transfer Process: Before play, we perform video tape inspection, repair, and cleaning. Capture of content is done via professional tape decks with composite, S-video, and IEEE 1394 connections, linked to video ingestion software systems, to provide high quality capture and intermediate file types before final formatting to your requested disc and/or data file format. Other Info: Blu-ray Disc is becoming more popular, while DVD has been the standard. Blu-ray Disc can hold up to 9 hours of video tape content, with DVDs holding just 2 hours. The most commonly requested file formats are H.264 mp4 for easy access and storage and sharing; and H.264 MOV or AVI file types for video editing. Depending upon the source video tapes, resolution of the video content is standard definition 720x480p from VHS and most camcorder tapes, and 1280x720p or 1920x1080p resolution for content transferred from HDV tapes. Return Formats: Your choice of DVD or Blu-ray Disc, and the backup data files can be formatted as MP4, MOV, AVI, WMV or other files types. The data files are placed on your provided flash-drive or external hard-drive or on storage media purchased from Cintrex (see extra options during checkout). All drives are formatted in exFAT, for compatibility with Windows or Apple OS systems. Pricing: Price is $30 per NTSC tapes and $45 for PAL or SECAM tapes. Quantity discounts begin at 10 tapes. Instructions: When placing your order in our online ordering system, please include your instructions to us within the comments section. Be specific about how you want your final product output to be organized, file names, on-screen titles, any extra copies, etc. If we have questions about your order's instructions, we will email or call you. Shipping: A UPS shipping label can be created from our website for attachment to your inbound package to our labs. Shipping is free on orders valued at $100 or more. A $7.50 shipping and handling fee is applied for orders greater than $50 but less than $100; and a $25 shipping and handling fee is applied to order values less than $50. From Lynn G. of Oklahoma City, Oklahoma on 1/23/2018 . Larry Molina and his team did a PERFECT job converting our 33 VHS/Hi8 home videos to DVD and flash drives. I asked Larry a million questions and changed my mind several times about what format and/or media type I wanted. Larry was ALWAYS patient, knowledgeable, & professional. He answered so many questions & talked me through the pros & cons of various options. Once I decided, Larry and his team did EXACTLY as I requested and did it in timely manner. From Jasur of Philadelphia, Pennsylvania on 4/10/2014 .